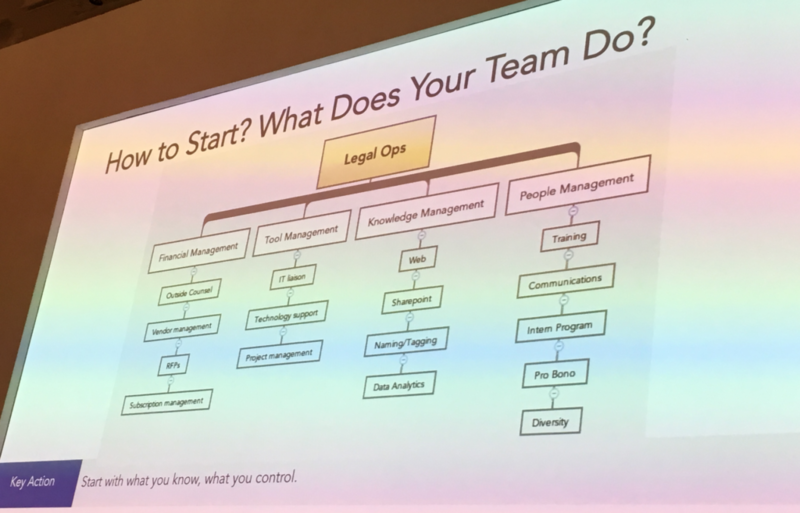 Artificial Lawyer attended the CLOC EMEA conference in London yesterday, and as well as meeting and chatting with an array of great legal innovation and legal ops folk, managed to attend a couple of sessions. The first was on data in the inhouse world, the other was on rationalising contract processes and legal automation. The two sessions neatly summed up the wide range of experiences across the inhouse legal world, ranging from elementary needs such as collecting data on which law firms you are using, to creating massive clause banks and working with LPOs and a range of tech companies to drive document automation at a truly industrial scale. Inhouse lawyers now find themselves in a new world, where tech, process, efficiency and data seem to have suddenly become a key part of day to day management discussions. But, the reality is that there is a huge range of capability levels present across the sector. Even just in the UK, we can see everything from GCs of major companies who still use a single Excel spreadsheet to manage and benchmark all their legal spending and see automation and AI tools as something beyond their horizon, to GCs who are as up to date and pioneering on innovation and real world implementation of the latest legal tech strategies as the most advanced law firms in the world. There is also clearly no ‘inhouse standard’ when it comes to legal tech, use of data, use of tools, or any agreement on the best processes and optimum targets for improved efficiency. It’s a world that is still very much taking shape, with some leading lights out there and a lot of people who remain in the dark, though who clearly want to know more. On a global scale then that range of knowledge and expertise is even broader – hence the value of CLOC, and also other organisations and conferences that are exploring and developing insights on these issues. So, where shall we begin? Let’s look at a couple of themes, one was on metrics and data, the other was on getting your contract stack in order. Data…What Are You Trying To Use It For? Measuring people’s time in the inhouse world is not popular – even if it may be a useful metric to understand efficiency and processes. There are loads of simple places to start, if you are not already doing so, covering standard rates, legal spend, use of firms and use of your KM systems. If you’ve never really tried to measure things before, then start small. Focus on metrics where you can actually get that data – no point chasing metrics where your business has a bunch of silos that make it impossible to gather the data. 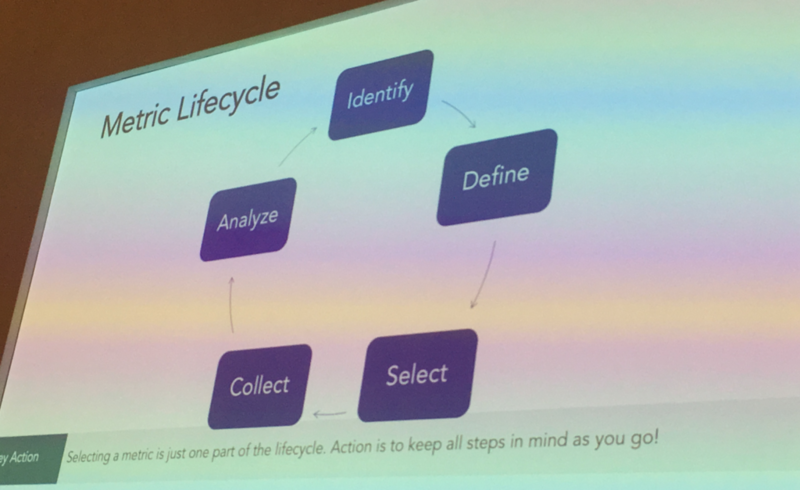 And, think of metrics as a continually developing cycle of collection and iteration, (see pic below). Gather data with a purpose – i.e. if you are building a metric, what behaviour are you trying to change, and change in what direction? Otherwise, what is the point of collecting data? Just collecting data to fill Excel sheets doesn’t make much sense, it needs a purpose, and that purpose is likely to mean seeking to change behaviour in some way, e.g. how much time is spent on certain contracting processes, how much is spent on certain types of work, finding out where the bottlenecks are in the in-house team. This was a really refreshing and real world take on legal data, which can sometimes get a bit too esoteric as a subject. This was back to basics, and which Artificial Lawyer would sum up as: data is the evidence you need to drive change. Great stuff. First, we examined all the transactional work that we did. Transactional work is basically about templates. So, we can build templates with different options. The question then was: who owns all these templates – and there were a lot of different stakeholders who had made templates over the years. Some templates had not even been reviewed for more than five years. For the customers we looked at making contracts simple. We saw that where there is a high volume of transactions and some level of standardisation then things can be automated. And this can drive contract velocity – which we measure. This was done with SmartSheet and law company, Elevate. Lyons also said that after analysing their work streams they saw just how much of that work could go to other providers they could partner with, like LPOs such as QuisLex. Always get a vendor to build you a sandbox so you can really experiment with a new application, don’t just accept a demo. Seek and demand changes to products that suit your needs. Whoever is going to use the tech tool needs to test it, it cannot be just done by other people for you. And finally – as you improve your processes, and then collect data on how this has helped, you will find the finance team is much more open to funding the growth of your team and giving you the resources you need. 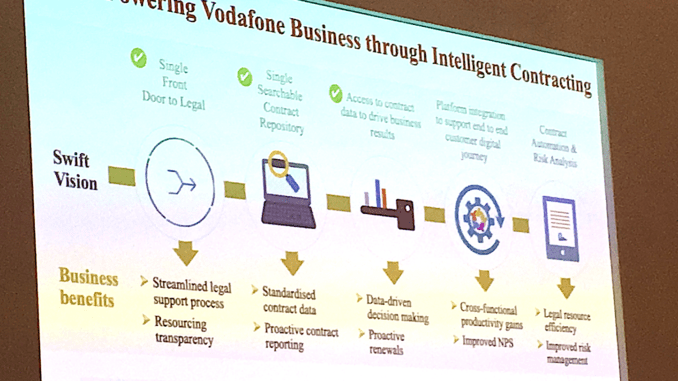 And, then we heard from Kerry Philips, who leads Vodafone’s Business Legal and External Affairs team. She talked about contracting more broadly and especially the need to deal with all your contract data, right down to a clause level. She also talked about the Swift system she developed (named after Taylor Swift) – see pic above. Spent six weeks working out what all of us were doing. Getting all that data was one of the best things we did. Hired two Six Sigma experts to interview everyone to find out what we were all doing. Focused on: People, Process and Tools – and also communication, as that was going to be needed for what was a change management programme. They found all kinds of challenges, e.g. senior inhouse lawyers spending time on NDAs. So, set up capabilities in India and also a shared services centre. They mapped out their processes and saw where there were delays and duplication. Streamlined the templates they used – many of which were so complex not even their own lawyers had the time to look at them closely. Started using contract automation tools to speed things up. 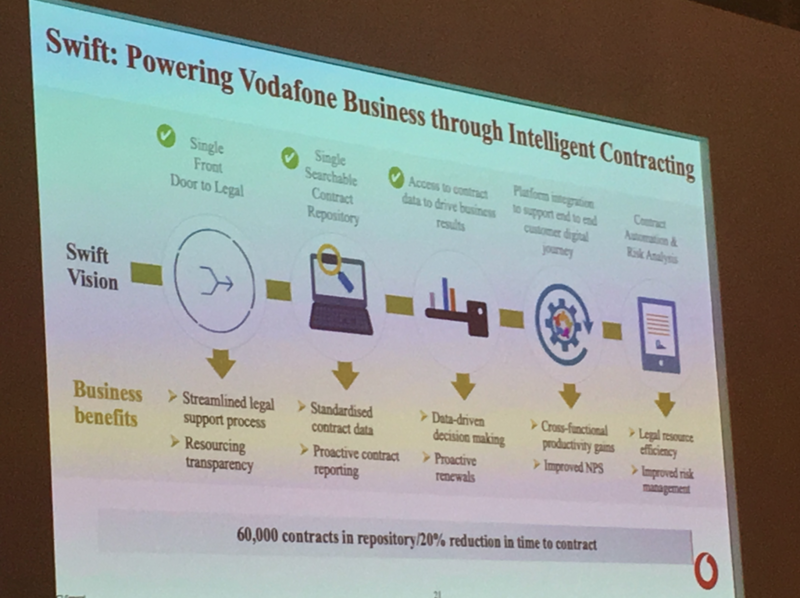 And also focused on developing a clause library – not just a template library – which was a key development for Vodafone. This resulted in around a 20% reduction in the ‘time to contract’. That may not sound like a lot, but consider how much that really is for a large company – it’s actually a HUGE improvement. Also that improvement can get better, and it also helps the business. As Philips noted, any business experiences a crunch around ‘contracts to cash’ i.e. from selling to a customer to getting the money. The longer and more complex the contracting process the more legal is holding back the business and unintentionally creating real challenges for the CFO. Understandably – and after a few hiccups along the way – the business saw the value in what they were doing. The great thing about inhouse use of legal tech and development of new processes is that none of it is ever done for show. The legal team is not selling to anyone outside of the business and the CFO has everything they do on a very tight budget. This makes the work around legal ops intensely real and means it needs to be effective or else it will be killed off. The flip side is that the financial and resource pressures can mean it’s hard to change things. But, the speakers showed that they had started with areas that could deliver value and then moved onto more complex challenges. The end result was always positive, even if there were challenges around data cleansing. Overall, CLOC was a very positive experience. Artificial Lawyer hopes to engage more in the future with many of the excellent speakers at the event.